When you are using any version of Avast Antivirus, then your all desktop email clients get the notification of Avast signature in your email. Here we are to discuss the possibilities for avast email signature removal, from all the email clients. Avast uses the tag that this email has been sent from a virus-free computer protected by Avast in al the emails that are generated by the avast safe computers. Avast antivirus actually gives the special attention to the incoming and outgoing data from your computer and keep the checks for any sort of threat that may appear. In every mail typically you send, Avast email signature is added claiming that this email is absolutely secured and protected by Avast. This means that all the contents of the email are safe and they cannot be hacked or get phishing attacks. But sometimes actually it becomes odd when your official email is having a line by any third party and can adversely affect the image of yourself or your organization. so we advise that you remove Avast from email signatures. When you are using the email clients like Gmail, Yahoo mail, outlook, live mail, and any more emails, then if your computer is running with any version of avast antivirus later then 2015, then you will get the email signature from Avast into your emails. However, there is no need to be worried about as your private information is always safe with avast. Still, we can say that these email signature can be of a hassle for many and they may want avast email signature removal. There is still one renowned browser that does not support avast email signature, at all. Well, Opera browser does not give any kind of he email signatures when accessing any email client. Not only avast but the other antivirus companies like avg and Norton also uses the same technique of the email signature. This thing in the email is done by the companies just due to that fact of promotion of their own brand. However, there is no need to be worried about as you can remove this email has been sent from a virus-free computer protected by avast message without losing the security features of avast. How to turn off avast email signature? How to remove Avast signature from outlook? How to remove Avast signature from Gmail? Avast signature in the email is the assurance of security that you get from the Avast antivirus. Avast ere simply make sure that there is nothing spammy on both the ends, from where email is sent and from where email is received. How to get rid of avast email signature? Right-click on the Avast orange icon in the Windows system tray and open Avast UI. Virus-free – in the Avast antivirus 2017 and avast antivirus 2018. This email has been sent from a virus-free computer protected by Avast – in the avast antivirus 2016 versions. This email has been checked for viruses by Avast antivirus software – in case you are still using the avast antivirus 2014 and avast antivirus 2015 versions. This email is free from viruses and malware because Avast Antivirus protection is active – if you are still protected by avast version 7 or olde versions. Well if you really are using these versions then I will say that you shall upgrade to new antivirus right now. There is no way by which you can change or modify this message. There are many ways, however, by which you can change the setting to turn on/off this message and remove avast signature from email. Disable the signature of avast in simple ways. In the latest version, this is really an interesting and easy process. In avast 2018, it does not matter that your mail shield is installed or not. There is a simple one-way method. 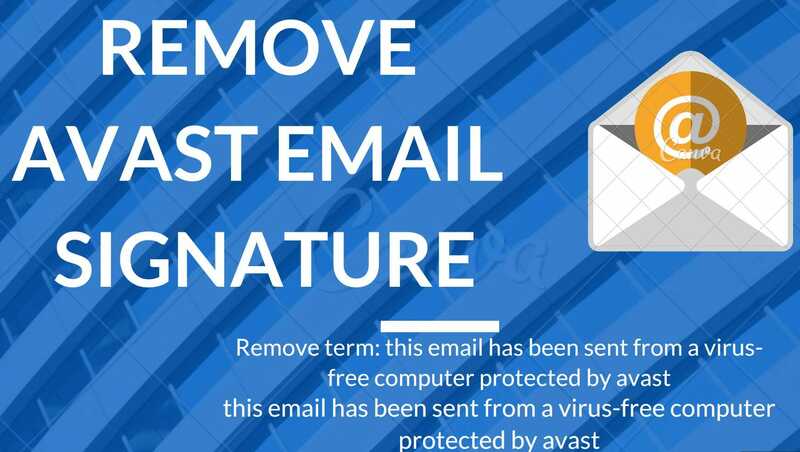 When you are seeking to remove the avast signature from your email, in avast 2018, then you shall follow the steps below. Go to your Avast interface by double-clicking on the avast icon in the Windows system tray. Or you can find Avast in the Windows Start menu – All Programs – Avast. un-check it and confirm by clicking on the OK button. log in to your email account, there will now be no notification for an avast email signature. Make sure you have updated your password manager. You can also remove the avast signature from Gmail by using this method simply. You can download the latest avast version from www.avast.com. You can also use the Avast Secure Browser as your official email client. This is also a good method to save up your precious data. go to Settings – Active Protection – Customize link in the Mail Shield row. login o your email and you have disable avast email signature, there will be no more notifications. When using the Avast 2017 or earlier then you can remove avast email signature by simply using these steps. You can remove the avast signature from the older versions of the avast antivirus also. In the older antivirus versions of avast, the email signature simply appeared due to the fact that you email is protected by the mail shield that is present in avast antivirus. So in these cases, you can do by following these solutions. check (if un-checked) the Mail Shield component. Click on Change and wait until the setup finishes. Now Since you have added or enabled the mail shield of your avast antivirus 2016 or older versions. No all you have to do is remove the email signature from you avast mail shield. And you can finally get rid of avast email signature. In this method you will be simply shanging the settings in the EmailShield.ini File. confirm Avast dialog if needed. You can easily turn off the email signature from avast or outlook without any sort of problem using and following the all above stated steps. Avast email tag sometimes looks odd in your fully decorated email. It is advisable from our side that you simply stop avast email signature. We have by now covered the complete process by which you can remove avast signature from email. We have shared some screenshots in the article regarding the avast antivirus.Your interface may vary from the screenshots, but we think that you can grab the bit change and can find the respective options in a bit more of scrolling.